Motoring experts have argued the same question for years - which Italian supercar is superior - the Ferrari or the Lamborghini? Now you can settle the debate and answer the question yourself with this Ferrari & Lamborghini Thrill experience. This fantastic driving package allows you to slide behind the wheel of two of the most exclusive supercars on the market. The Italian’s are masters when it comes to engineering luxury super cars, so it’s easy to see why both prestigious brands are a sign of high status for those lucky enough to drive them. 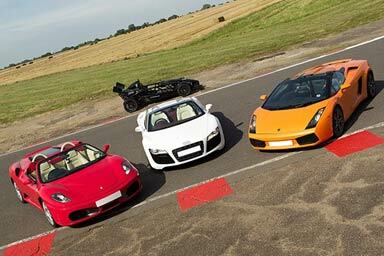 During this experience, you will drive 6 adrenaline-fuelled miles in each the Ferrari and Lamborghini, and upon completing your final lap, it’s then time to slip into the passenger seat for a high-speed ride in a super saloon from your professional instructor. All drivers receive a souvenir photograph of their day to take home as the perfect reminder of such an amazing day out. *The person driving the car will be required to sign a disclaimer accepting liability in the event of damage to the vehicle. The driver will be given an option to purchase damage waiver cover when booking to minimise their financial exposure should there be an accident. Drivers are under no obligation to purchase this optional waiver. Full details are available at the time of booking. This experience is available Monday to Friday, throughout the year. Weekends are available for a £20 fee payable directly to the supplier. The maximum height is 6ft 4" (1.9m) and the minimum height is 5ft (1.52m). The maximum weight for all participants is 20st (127kg). You may be asked to sign a disclaimer on the day. A Full UK or International manual driving licence with no serious offences. You must be able to drive a manual transmission.